A Maryland woman turned her life around after climbing a set of stairs. Eighty pounds later, she’s still going. KENSINGTON, Md.– In the pre-dawn hours, Kassie Barnes seeks solace and strength at the gym. Some might consider the 51-year-old real estate investment pro and proud Kensington, Maryland mom a “biggest loser.” But Kassie sees herself as a true winner. “I started my fitness journey over two years ago. I have lost 80 pounds and I am still going,” she says, as sweat rolls down her face and turns her hair to curls. Barnes is fond of saying that she walked out of her cardiologist’s office and into her neighborhood gym, huffing and puffing as she went up the stairs of Anytime Fitness for the first time. The image stuck with Jim Edwards, who later became her trainer. He said he knew as he watched her climb the staircase that it would take a long time and a lot of work to undo all the damage caused by years of inactivity and a poor diet. But he could tell from the beginning that her head and heart were in the right place. “There is no gimmick. This is old-fashioned. This is hard work,” Edwards says, noting that Barnes has succeeded. 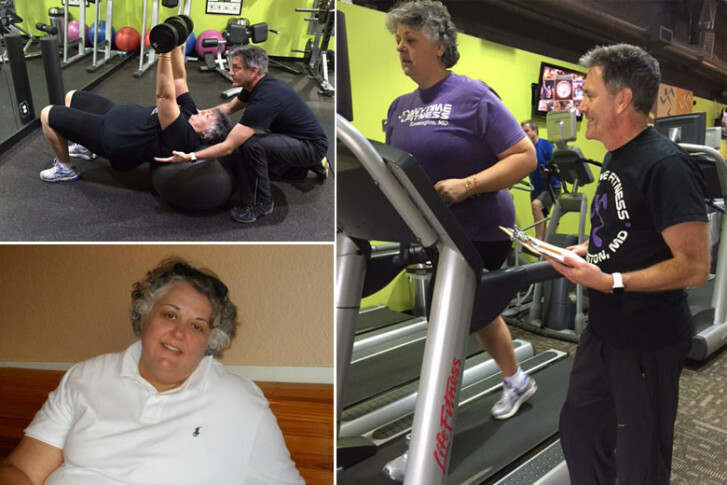 She made exercise part of her regular routine, and now serves as an inspiration for others. Her stats tell the story. Barnes’s blood pressure has gone from high to normal, her resting heart rate is now that of a top-flight athlete her age, and she is being weaned off sleep apnea treatment. Cardiologist Warren Levy, the chief medical officer of Virginia Heart, says those are just some of the benefits of an active lifestyle. “It will improve your energy, your mental health — it will improve, in fact, your immune system,” Levy explains. An accomplished runner and cyclist, Levy preaches the power of exercise and warns of the dangers of just sitting on the couch and carrying too much weight. “For those who are sedentary and overweight, I know that this can seem like a daunting task, but you need to start somewhere. Start slow, and don’t have expectations beyond what is realistic,” he advises. This is what separates Kassie Barnes from contestants on the “Biggest Loser” on TV with their mega-workouts and rapid, dramatic weight loss. “I don’t think it is realistic at all because it is not sustainable,” she says. And while her 5:30 a.m. exercise schedule Monday through Friday isn’t for everyone, it does work for her and fits easily into her everyday life. It’s a routine with a strong mind-body component. Barnes believes that many people fail to lose weight or maintain a loss because they have not addressed the emotional issues facing them. So, in addition to working with a trainer for her body, she has sought help getting her mind in shape for her weight loss journey. “Unless we target what we are thinking and feeling, the behavioral changes that we make are fleeting and temporary,” says Robyn Osborn, a clinical psychologist who specializes in weight management. Once depressed about her weight, Barnes says she is now empowered to make healthy choices. An ice cream outing with her son and his friends used to be an excuse to indulge. Now a half scoop of her favorite flavor does the trick. It’s a story she tells a lot — an example of how she has changed her relationship with food. Barnes doesn’t deny herself that ice cream, she just controls the amount. Tell the story to Robyn Osborn, and the psychologist — who struggled with obesity in her youth — responds with a knowing smile. She agrees with Barnes that having a healthy relationship with food begins with having a comfortable relationship with yourself.